San Bernardino Mountains in Southern California is about an hour and fifteen minute drive from our home in Azusa. There are abundant forests in the vicinity of Silverwood Lake. The landscape is rich with inspiring subject matter. 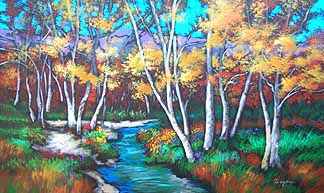 Here I've featured birch trees overlooking a small stream. The water sparkles with reflections from the blue sky above while lavendar mountains keep silent watch. Contrast is an important element to have in a painting. Try to get your darks nice and dark, but connect them - like a necklace of different sizes and shapes lying on the work. The connections don't have to actually touch. They can be very close together like stepping stones. Eugene Delacroix taught that if you try to be perfect at everything as an artist, you'll achieve it in nothing. But it's fun learning and trying to improve as an artist and also as a writer and website designer.